Yes the citizens still owe $87,783,723 for Koos’s Uptown dreams. That is why citizens are on the hook for $56,106.352 just for these two pension funds. Obviously the guys protecting lives in Normal have little value to the Council. Their pension money was spent creating Uptown instead of funding the promised retirements. Why are IMRF employees more important that police and fire employees? One more – See PDF page 133. 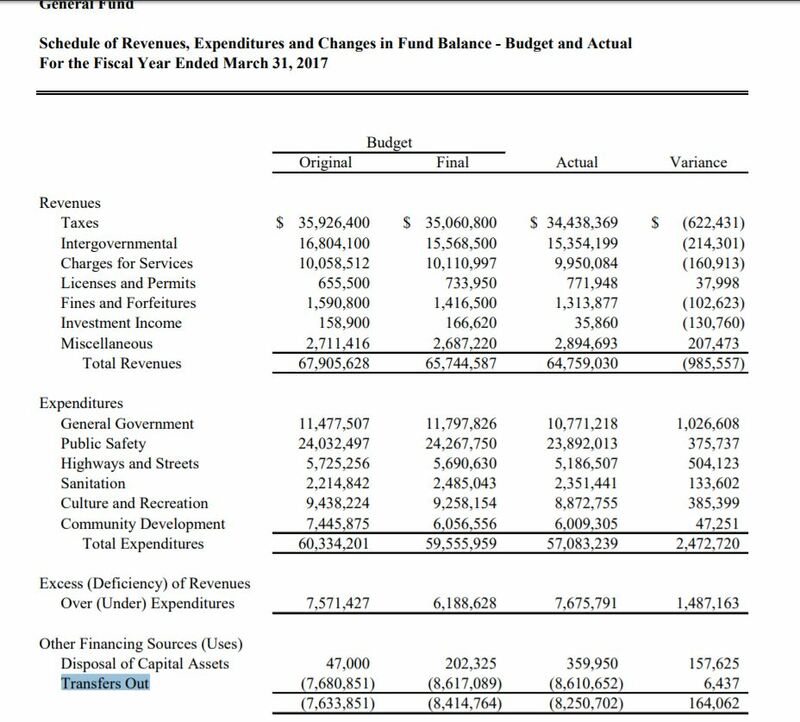 Revenues were less than projected. Expenses were cut to compensate. Look down the page a little farther at “Transfers Out”. $8,250,702 was transferred out of the General Fund. Where did it go? $1,580,710 went to the Uptown TIF! Tax Increment Financing Districts (TIF) are glorified as paying for themselves as property values rise. The redevelopment costs are supposedly covered by keeping all the new tax revenue. Obviously Uptown is not covering its costs. $101,332 was transferred out for the new fire station. I don’t know where the rest of the money went, it would take much more research. Understand why early retirements were offered? Posted in BloNo, Koos, Liberal Media, Local, Normal, pensions, Progressives, Taxes.Tagged Chris Koos, Debt, fire pensions, General Fund transfers, police pensions, uptown, Uptown TIF. …But on the bright side .. give me a minute … ahhh ,, ahh .. never mind ..
Last night on the Peoria news one story about the city deficit mentioned pensions being a large portion of the debt. When is this state and cities ever going to come to the reality that these golden pension plans are not sustainable. They keep digging the debt hole deeper and deeper. They are a disaster, but they are made worse by decades of government not funding them and therefore not collecting interest on what is paid in. Bloomington did the same thing but now they are trying to make up for it by killing the citizens while not cutting any spending to compensate. Portillos will make MILLIONS and SAVE THE WORLD! Sit back and have a hog dog or Italian Beef..
And Bloomington WANTS to emulate these numbers? I guess IF you don’t do audits the numbers WILL add up! Careful, Diane. Bringing this up is rather, “reckless, irresponsible and risks damaging our uptown branding.” Or, so says one of our Council members responsible for this mess. If this was a real business in the real world, Normal would be in be going via the way of Sears by now. Next Post Normal’s priorities: What?